Let’s take a few minutes and talk about the differences between Alzheimer’s and Dementia. The most commonly asked question is what’s the difference between the two? 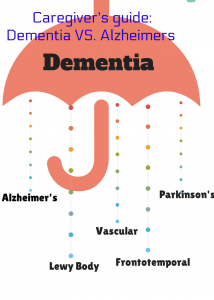 Dementia is an “umbrella” term for a group of symptoms like memory and thought process. It is normally associated with the elderly but, it has also been known affect a younger generation as well. Alzheimer’s is not the only disease that is considered “dementia” other causes of dementia include Huntington’s disease, Parkinson’s disease and Creutzfeldt-Jakob disease. According to the Center for Disease Control, Alzheimer’s disease cause 50%-70% of all dementia cases. In fact, Alzheimer’s is a very specific form of dementia. Symptoms of Alzheimer’s include impaired thought, impaired speech, and confusion. Doctors use a variety of screenings to determine the cause of dementia including blood tests, mental status evaluations and brain scans. When a person is diagnosed with dementia, they are being diagnosed with a set of symptoms. This is similar to someone who has a runny nose. Their nose is runny but it is not known what is causing that particular symptom. It could be allergies or a common cold. Similarly, when someone has dementia they are experiencing symptoms without knowing what is causing those symptoms. “Being a caregiver can be hard especially when your loved one has dementia. My grandmother was an extremely loving, caring and respectful to everyone she met before she was diagnosed with dementia. The last Christmas that we had with her I was in the kitchen pouring myself a glass of sweet tea and my grandmother looked at me and said “be careful with that you’re going to get fat” my reply was, “too late” . This woman looked at me and said,” you’re right I never thought you would get that fat” this was something that would have never come out of my grandmother’s mouth if she didn’t have dementia. This hurt my feelings very much but, one thing I had to keep reminding myself was that wasn’t her that wasn’t the woman that helped raise me.